Belgian team Etixx-QuickStep has announced its roster for the 2015 Giro d’Italia, which starts this Saturday, May 9. There’s no surprise that Rigoberto Uran is announced as the team leader, the Colombian having placed runner-up in the past two editions of the Italian Grand Tour. Uran is one of the leading contenders heading into the three-week event, particularly since last year’s winner Nairo Quintana (Movistar) is absent as he prepares for July’s Tour de France. Uran’s main rivals for the overall title will be Richie Porte (Sky), Alberto Contador (Tinkoff-Saxo) and Fabio Aru (Astana). 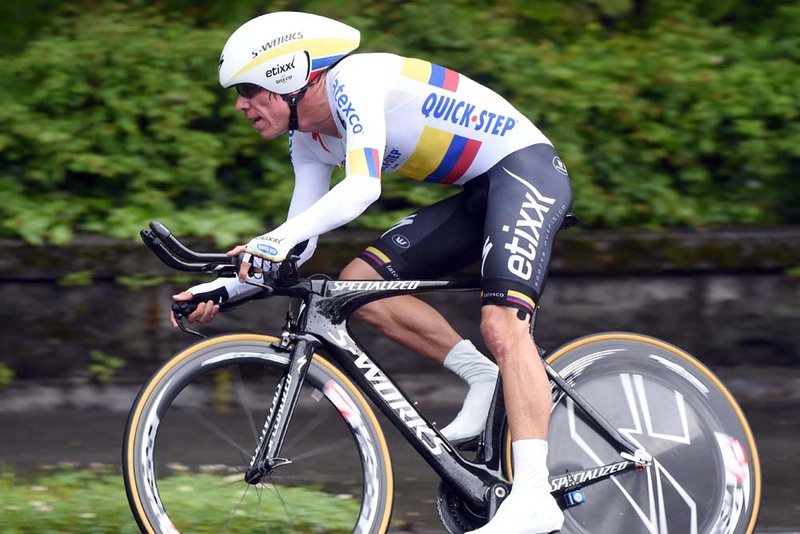 Uran’s sole victory so far this season is his Colombian national time trial title, though fifth in the Tour de Romandie last week shows he is in good shape. Uran will be backed by eight men in his bid to win the coveted maglia rosa: Tom Boonen (Belgium), Maxime Bouet (France), Pieter Serry (Belgium), Gianni Meersman (Belgium), Fabio Sabatini (Italy), David De La Cruz (Spain), Iljo Keisse (Belgium) and Petr Vakoc (Czech Republic). As previously announced, this will be Boonen’s first ever appearance at the Giro d’Italia. Boonen made his return to racing at last week’s Tour of Turkey having been forced to miss the Classics due to a shoulder injury sustained at Paris-Nice. The 34 year old will use his experience to captain the team on the road, and also have a free hand to take stage wins if the opportunity arises, particularly as the team does not field a dedicated sprinter. British sprinter Mark Cavendish is not riding in the Giro this season as he once again takes part in the Tour of California in America (May 10-17), which runs concurrently with the Giro. The 2015 Giro d’Italia starts with a team time trial in San Lorenzo al Mare San Remo on Saturday, May 9, and concludes in Milan on Sunday, May 31.